Harold Schofield, a brilliant Oxford doctor who had laboured as a missionary in China for many years, was on his knees praying, 'Lord, give me missionaries from British Universities to help in China'. The day he died, D. E. Hoste applied to Hudson Taylor for mission work in the China Inland Mission (Now Overseas Missionary Fellowship). Schofield's prayer was answered as seven Cambridge students volunteered to leave behind cosy lives of wealth and privilege to serve God in whatever way they were led. These seven inspired thousands of others to think seriously of missionary service. Included among them was C.T. Studd, captain of England and the finest cricketer of his day - if he could give all that up, then so could anyone! The story of these seven are an inspiration that God can take people and use them in incredible ways - if they are willing to serve. 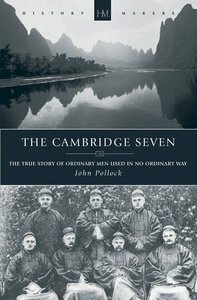 About "The Cambridge Seven (Historymakers Series)"
Harold Schofield, a brilliant Oxford doctor who had laboured as a missionary in China for many years, was on his knees praying, ?Lord, give me missionaries from British Universities to help in China'. The day he died, D. E. Hoste applied to Hudson Taylor for mission work in the China Inland Mission (Now Overseas Missionary Fellowship). Schofield's prayer was answered as seven Cambridge students volunteered to leave behind cosy lives of wealth and privilege to serve God in whatever way they were led. These seven inspired thousands of others to think seriously of missionary service. Included among them was C.T. Studd, captain of England and the finest cricketer of his day - if he could give all that up, then so could anyone! The story of these seven are an inspiration that God can take people and use them in incredible ways - if they are willing to serve. As Pollock says in his book ?Theirs is the story of ordinary men, and thus may be repeated'. Will it be repeated in your life?